Prohibition Agent Howard Brooke Oursler was shot and fatally wounded while attempting to arrest Edward Dudley for violation of the National Prohibition Act in Stillwell, OK. Also, wounded in the same incident was a confidential informant who had been working with Agent Oursler. 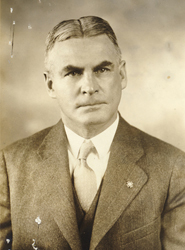 Prior to his death, Agent Oursler was able to identify Dudley as the assailant. Dudley escaped into the local hills, but was apprehended several days later and made a full confession. Ironically, he was to be a candidate in the ongoing elections for Constable. Dudley was later convicted of murder and sentenced to life imprisonment. 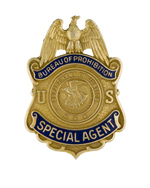 Agent Oursler joined the Bureau of Prohibition on June 20, 1929, with an annual salary of $3,000. He carried badge #464. Agent Oursler was born in Pittsburgh, PA. He was survived by his wife, Jeannie May (née Smith). Agent Oursler is buried in Pittsburgh.